The Moscow Zoo situated in the very center of the Russian capital is one of the largest in the world. The oldest zoo in Russia, established in 1864, passed a long way from a small zoological garden to the large scientific, educational and conservation institution. The Moscow Zoological garden was founded by the All-Russia Emperor Society for Acclimatization of Plants and Animals. From the first days of its existence the Zoo became extremely popular with the citizens. It was financed by the entrance fees and supported by generous charitable gifts, including contributions by the Royal family. When the Bolsheviks came to power the Zoo, greatly damaged during the revolutionary battles, was nationalized. The new authorities favored the Zoo popular with the common people. The territory of the Zoo was doubled, the collection of the animals was greatly enriched and a number of scientific institutions and laboratories were created. 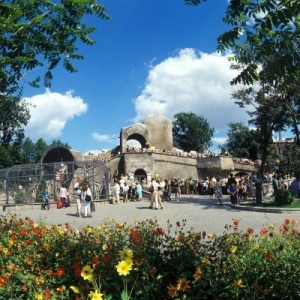 The latest large-scale reconstruction of the Zoo was carried out in the 1990s. All reconstruction and modernization works were completed by 1997, timed to the celebrations of the 850th Anniversary of the City. Nowadays the unique collection of the Zoo numbers over 7,000 species. The animals are kept in the open-air cages and pavilions designed in accordance with the natural habitat. One of the most famous Zoo's constructions is the Animals Island built in the 1930s. It is a high stony rock surrounded by a deep-water ditch that separates the visitors from bears, tigers, lions and other large beasts of prey.The Zoo's monkeys live in the specially constructed Primate House. The glass pavilions that imitate the natural habitat are home to 24 species starting with primitive primacy and ending with anthropoid apes. The Night World exhibition is also worth visiting. It is located in the basement under Animals of Russia exposition and designed as a large dark cave with illuminated window of enclosures. Each enclosure has shelters imitating burrows, cavities and hollows similar to the type of shelters the night animals naturally hide in during the daytime. But the enclosures that are red lightened have one glass side and so the visitors can watch animals even when they sleep. Among the animal exhibited there are various rodents and chiropters. The Moscow Zoo also features the Exotarium. The large marine aquariums that are up to 3,000 liters are inhabited with the most exotic fish and creatures of the Pacific and the Indian oceans, Black and Japanese seas. The underwater landscapes of tropical and northern seas are masterfully recreated with the use of the state-of-the-art technologies. With its numerous playgrounds, souvenir shops and cafes the Moscow Zoo is the perfect day out for the children of all ages.